Verse 17 expresses the idea that in the Millennium there will be an abundance of gold, enough to be used where brass is now used. There will be enough silver to use where iron is generally used, enough brass to use where wood is used, and enough iron to use where stones are now used. The rulers of Israel will be officers of peace, and the tax collectors will be honest and righteous. There will be no more violence, wasting, or destruction in all the land of Israel; there will be universal prosperity and peace. Even walls will be called Salvation and the gates Peace because of such perfect conditions. Keep in mind that we’re not talking about heaven here. This is the Millennial Reign of Jesus on earth. There will be detractors, but they will be shut down quickly. Before heaven comes Armageddon, after which Satan will be forever banned and condemned to the Lake of Fire. But during the Millennium, there will be peace, and Israel will thrive as never before. These verses, as in all of Chapter 60, predict a time when Jerusalem is finally acknowledged as the capitol of the world. All the nations who hated and persecuted Israel before will come to their aid during the Millennium, and will serve the nation and help with the rebuilding. Jerusalem will become beautiful again, as will all of Israel. 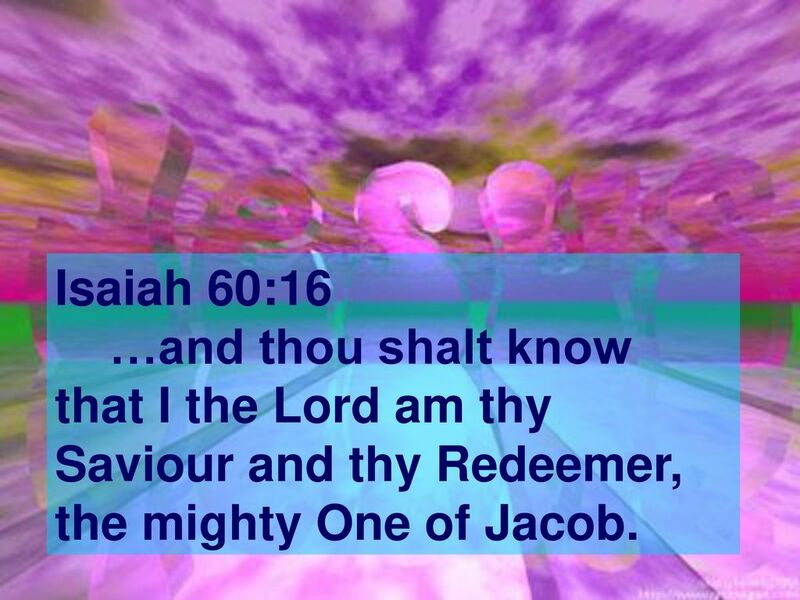 The city, and the people, will be nourished by the presence and the presents of the Gentile leaders, and all peoples will finally recognize that God is Savior, Redeemer, the Mighty One of Jacob. Well, this day certainly didn’t go as planned. First, we were getting dire weather reports of a cataclysmic snow storm overnight. It actually yielded about half-an-inch of snow. The temperature stayed right a freezing, and there was some rain. Dangerous driving conditions. So there was no Sunday school, only a morning service, which when I went to bed last night I fully expected to attend. I always know it’s going to be bad in the morning when I wake up several time in the night because I moved, and it hurt. So I wasn’t surprised at all to get up only to plop right back down on the side of the bed. Had to wait for my lower back and legs to wake up. 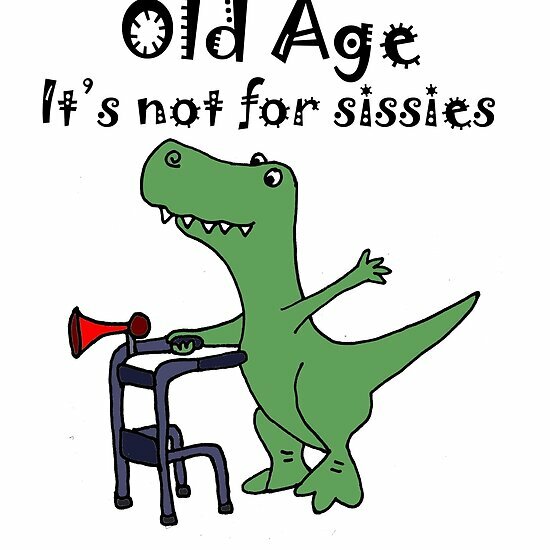 Once I was mobile, I exchanged my cane for my walker. No church for me today. In the meantime, Terry was out there industriously clearing the driveway and the sidewalk, and clearing icy gunk off the windows of the car. He came in, ate breakfast, changed clothes. Left the house in plenty of time to get to church. I don’t think it was five minutes before he came back. Radiator was leaking. (This was in our old Volvo, which I didn’t even know was drivable. Don’t know why he was using it.) He dealt with that, and journeyed off again. He’d be a little late, but not too bad. Except he came back home again, and I honestly don’t remember what the problem was this time. In any event, we had a quiet day at home. I watched Ravi Zacharias on TV–he’s a great favorite of mine. Then I figured it was time to do my Sunday Morning Coffee post, but even though the spirit was willing, the flesh was weak. I just couldn’t work up the energy, and I feel really bad about that. I will pick up on the series I started two Sundays ago on why sometimes it feels God doesn’t hear our prayers, so if you’ve been following along with me on that, I will do the next part in a week. It is becoming more and more of a reality to me that my body is not going to let me return to my normal self, able to take care of shopping, laundry, cleaning, cooking, etc. Those days are over, and I admit I’m struggling with accepting that as my new reality. I still do what I can, but what I used to do in a couple of hours now takes me all day, because I need to stop and rest. I understand this picture in a whole new way these days! The “one-flesh”principle in the Bible becomes more of a reality to me all the time. I am blessed beyond anything to have a husband who willingly steps into whatever task needs doing. We’re going on 50 years in June. I can still hardly believe its been so long. It seems like harsh judgment, but there has been plenty of warning, and numberless opportunities for all nations to come to Jesus Christ. In the Millennium, Jerusalem and the Temple will be rebuilt. Nations from around the world will gather to help; to bring materials from their own lands including the trees of Lebanon. God says that He will make his Temple a glorious place, and all nations from around the world are welcome to participate in the process. Those who refuse are sealing their own fate. Everything is going to be different during the Millennium. The nations who hated the Jews for centuries will be helping to rebuild Jerusalem. The kings of those nation will minister to Israel, because God will have mercy on Israel and will draw all other nations to them in service and protection. Jerusalem’s gates will always be open, because Jesus will reign and there will be peace on earth. It will no longer be necessary to close the gates to keep people out, because the people will be coming to worship Jesus Christ, and to minister to the land of Israel. No more fear, no more sorrow. It is hard to imagine all that in this time when Israel is the target of all the surrounding nations. Things will certainly be different when Jesus comes! 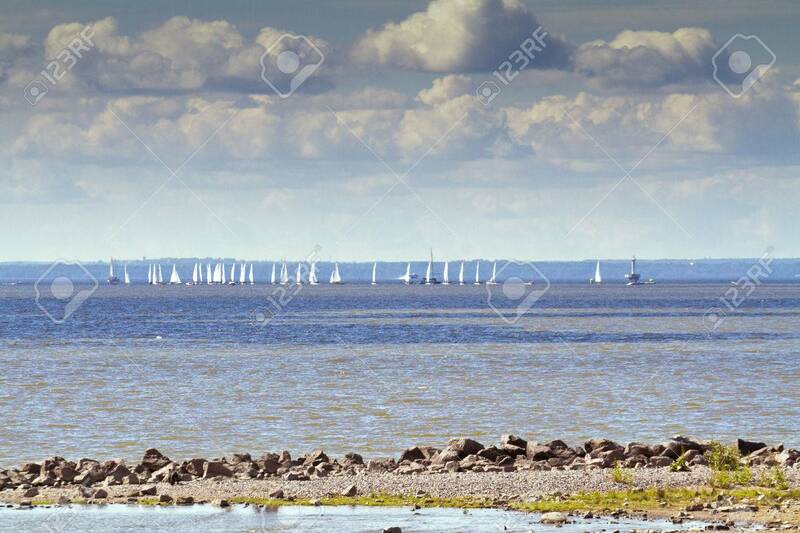 The picture in verse eight is not of actual birds, but rather of sailing ships, their sails like clouds, coming over the horizon toward Israel, as clarified in the next verse. The prediction concerns the regathering of Israel and their coming in ships from the far ends of the earth. Gentiles will help in this regathering and the restoration of Palestine. The reference to clouds, and doves to their window, is appropriate in view of the ancient custom in the East, of building special cotes for the birds. Camels are fascinating creatures, perfectly created for desert travel. Their feet don’t sink into the sand. Their bodies possess many little cells to be filled with water, which makes them perfect for the desert. Those cells can be filled in one 15-minute drinking session, and can last for 20-30 days. There are sometimes referred to as land-ships, they can carry 600-800 lb. loads. 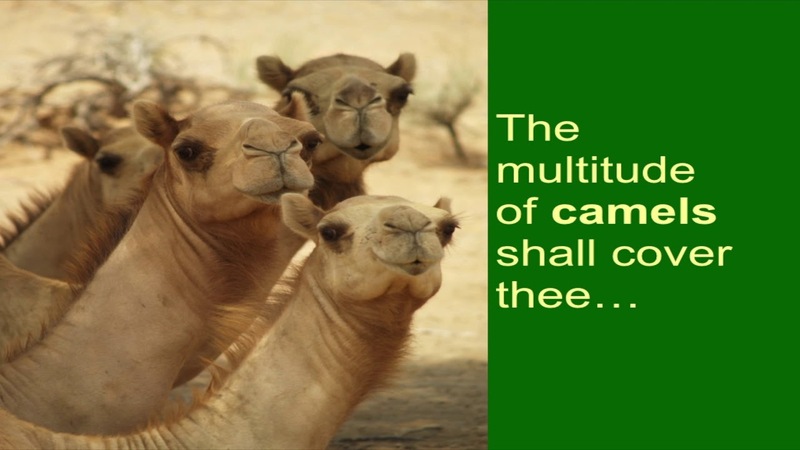 Bactrians have two humps; dromedaries have one. The prophecy here indicates that people from all lands, using camels for transport and as beasts of burden, will flock to Israel. They will be bringing expensive gifts such as gold and incense. It is said that the magi who visited Jesus when He was a little child brought gold, frankincense, and myrrh; they most likely traveled on camels. Here we see that scene re-enacted, only this time Jesus is indeed Messiah, acknowledged to be so by His own people.